Design Corps, the Social Economic Environmental Design (SEED) and the Pacific Rim Community Design Network, are pleased to announce the SEED + Pacific Rim Awards Winners. For the first time, these two international networks are combined efforts to support and promote systemic change in the practices of design with the intent of building on the common ground they share. This year the SEED + Pacific Rim Awards represent the greater global scale and growing relationships needed to create truly sustainable projects and positive change in all communities. While each network has a unique focus, sharing the awards acknowledges their common ground: supporting the growth of excellence in public interest design. A total of six projects have been selected for awards through a competitive juried process. Three winners were selected by each of the two networks that represent their principles and selection criteria. Each jury also gave Honorable Mentions to recognize excellence in additional projects. The six Award Winning projects will each receive a $3,000 honorarium for a trip for one team representative to present their work at an international conference, taking place at Singapore National University on December 14. This conference will be open to the public, and is a combination of the bi-annual conference of the Pacific Rim Community Design Network and the annual Structures for Inclusion Conference. In addition to the Awards presented on December 14, the event will focus on sharing built works, research, networking and discussions which can advance the collaborations and support future efforts of all attendees. Farhana Ferdous — Howard University, Washington, D.C. Participation: Have community members and stakeholders been involved in the design and planning processes? Effectiveness: Does the project address the community’s critical needs and challenges? Excellence: Does the project achieve the highest possible design quality, relate with its context, and dignify the experiences of those it touches? Inclusiveness: Does the project promote social equity as well as reflect a diversity of social identities and values? Impact: Are the social, economic, and environmental impacts of the project known and being measured? Systemic: Can the project or process be scaled up to have a broader impact? Location: To showcase achievements in the region, projects must be located in Asia, Australia/New Zealand, Pacific Islands, and the Americas. Design Corps creates positive change in traditionally underserved communities by using design, advocacy, and education to help them shape their environment and address their social, economic, and environmental challenges. Design Corps was founded in 1991 with a mission to create positive change in traditionally underserved communities by using design, advocacy, and education to help them shape their environment and address their social, economic, and environmental challenges. Our mission is realized when people are involved in the decisions that shape their lives. Design Corps’ programs, including the SEED Network, the SEED Evaluator, and the Public Interest Design Institute, bring the skills sets of design and planning to empower communities. For more information, visit https://www.designcorps.org. Established in 2005, the Social Economic Environmental Design (SEED) Network provides a common standard to guide, evaluate and measure the social, economic, and environmental impact of design. 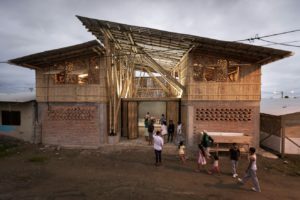 SEED is premised on the belief that design can play a vital role in the most critical issues that face communities and individuals, in crisis and in every day challenges. To accomplish this, the SEED process guides professionals to work alongside locals who know their community and its needs. This practice of “trusting the local” is increasingly recognized as a highly effective way to sustain the health and longevity of a place or a community as it develops. For more information, visit https://www.seednetwork.org. The Pacific Rim Community Design Network was launched following a working conference at University of California, Berkeley in 1998. Titled “Coastal Echoes: Democratic Design in the Pacific Rim,” the conference brought together leading community design scholars and practitioners from Japan, Taiwan and United States. The purpose of the conference was to provide the practitioners and scholars working in the field of participatory design and planning across the Pacific Rim region with an opportunity to share and compare each other’s experiences and advance their practice and research. Through conferences and joint projects, the network has provided a vehicle for collaboration and mutual support, as well as a forum for comparative understanding of community design in the fast changing political and social context of the Pacific Rim. Network members now span from Asia to North America, in countries including Canada, China, Indonesia, Japan, Philippines, Singapore, South Korea, Taiwan, and Thailand. More than 50 Years of Established Benchmark in Professional Architectural Education Excellence – NUS Architecture is a proven program, and the only one professionally accredited by The Royal Institute of British Architects (RIBA), Board of Architects (BOA) Singapore and Singapore Institute of Architects(SIA). Our students’ design experiences are augmented by hands-on opportunities under communal settings, to promote social and service enterprises. These experiences are supported by access to a wide range of digital prototyping, fabrication and representation technologies. The underlying premise of our education is humanistic, communal and embedded in user-centric concerns; and in the best of examples, our teaching approaches combine abstract theory with concrete practices. Techniques is merely a mean to a social end. NUS Architecture is as good as the dedicated and driven students who enroll in it. We believe that our future designers and thinkers seek inclusiveness, livability & right livelihood, ethical sustainability, environmental & social responsiveness, conviviality and cultural robustness in our built environments. Our faculty members have balanced experiences in design and research under diverse settings. They combine their strengths in theory, practice and international exposure to deliver a holistic educational experience. The Cultural Centre Chamanga was planned and build by students and teachers of three universities, from three continents. It is embedded in a broad academic network of experts and supporters, that came together in solidarity as a response to the earthquake in the spring of 2016 that severely damaged over 80% of the buildings in the fishing community of Chamanga. The organization at the heart of this effort, the Chamangue, and Cultural Collective Opción Más had been running programs in a rental house, destroyed by the earthquake. Their focus on using culture to provide positive alternatives to the youth was not only plausible but necessary after the earthquake. In workshops, run by the Ecuadorian architects Atarraya, expectations and possible design options were discussed. Particular care was taken to ensure a participatory decision-making process, in which various stakeholder groups were heard. The future users required an auditorium that might be extended to the street. A dance-studio, a library, an audio-studio and an office, that could accommodate a guest for a couple of nights. This spatial layout had to be realized on a plot of 135 m2 and should be as flexible as possible. A solution for the bathrooms had to be found, as there is no water treatment in Chamanga. A two-stage master plan was drawn up by the Portland State University enabling the students to plan the first construction phase and build it in September 2017. In October 2017, the University of Applied Sciences München who accompanied the development process of phase I since August, joined the effort. An interdisciplinary team of architects and engineers developed the actual design of the building that they came to build in February-March 2018. Since the opening, Opción Más has organized taekwondo classes, marimba lessons, and workshops related to skill-building and technical training on organic farming and fishing and have lent the space for several organizations to run their meetings. University of Applied Sciences Muenchen, Germany: Michael Arzberger, Lena Baumeister, Katharina Biet, Dennis Brandt, Fabian Fromme, Cinya Fürstenberger, David Glöckler, Andreas Haberlander, Paul Hacker, Ricarda Hörmann, Regina Keilhacker, Vera Kuisl, Caroline Makowski, Kathrin Pfeffer, Andreas Reiser, Anna-Lena Rischer, Deborah Rosenfeld, Stefan Seifert, Maria Zettl, Ferdinand Loserth, Philipp Bachert, Sandra Schmid: Students; Prof. Dr. Christof Dauberschmidt, Prof. Dr. Andreas Scholz, Prof. Dr. Lars Schiemann Structural Engineers;Ursula Schmid Baamboo Construction; Prof. Ursula Hartig Project Lead. Master Artisans: Valentin Angst, Fabian Burbano. Client/User: Alberto Lopez Baltín, Ericka Godoy Mejia, Mauricio Gudio, Nathaly Godoy, Vladimir Patiño, Mebers; Soledad Godoy Mejia, President. Mental Health by Design is a New York City pilot program that transformed disused classrooms in high-need high schools into spaces promoting mental health, including meditation rooms and a recording studio. Each project began with a school community’s grant-winning project vision, and was designed by one of seven local design firms, in collaboration with students, faculty, and administrators. We completed 15 projects in four boroughs in three months, with $10,000 each (Karen Kubey oversaw the nine interior projects). Recognizing the impact that built environments can have on healthy social-emotional development during adolescence, the New York City Department of Health and Mental Hygiene (DOHMH) launched Mental Health by Design (MHxD) in December 2016, to support built environment projects with defined goals of promoting or improving student mental health. The initiative was funded through ThriveNYC, New York City’s comprehensive roadmap to promote the mental health of all New Yorkers, and was adapted from the DOHMH Active Design in Schools program, which promotes healthy physical environments in NYC Department of Education public schools through design enhancements, training and technical assistance. Innovative, discrete interventions that will change the lives of many students and make schools into safe places again. The succession of multiple projects that tackle space by space is very interesting. It shows some level of continuity that can lead to future sustainability. The approach of using design to provide health is a very innovative approach. The integration of firms and community members is also well developed. This is a scalable intervention that is much needed while still being very unique response to a need. Brooklyn College Academy: Principal: Nicholas Mazzarella; Project lead: Linda Noble, Ph.D. 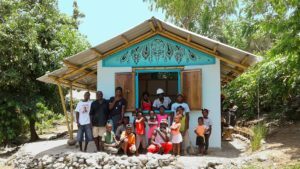 In 2017 Oficina Design, Heliotrope Foundation and the people of Cormiers, Haiti, designed and built House Louisana- A house for Louisana and her extended family who lost their home during the earthquake that devastated Haiti in 2010. House Louisana is the third building designed and built in Cormiers by Heliotrope Foundation as part of Konbit Shelter, a re-building program started by this non-profit organization after the earthquake. Oficina Design conducted the design and the construction of House Louisana, an earthquake-resistant and sustainable work that integrated architecture and art, and involved local and many from the local community -teachers, farmers, artists, and school kids- in every aspect of its creation. 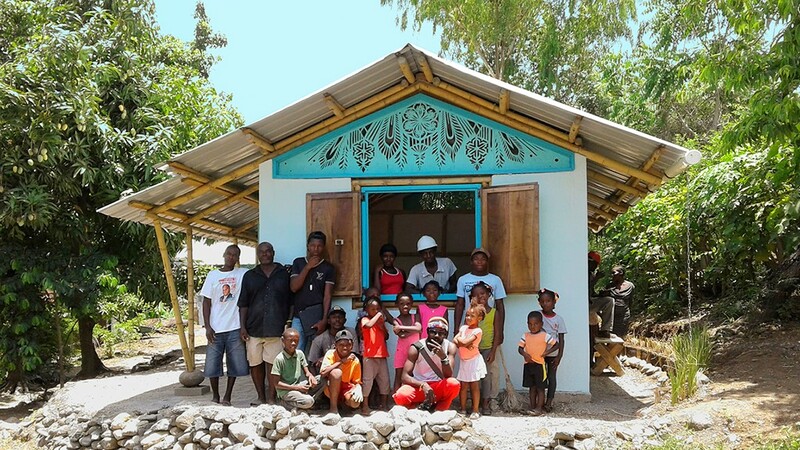 House Louisana provided much needed shelter for that community, but it also achieved the main goals of the project: It educated and trained the community on safe and sustainable construction standards through a series of free construction workshops. It showed that a permanent infrastructure can be built with low technology and inexpensive but efficient solutions that can be followed by others in that community. It stimulated the local economy through fair-paid labor and purchase of local construction materials and services. The design of House Louisana was inspired on vernacular Haitian architecture elements such as double pitch roofs and front porches; it creates a dialogue with its rural surroundings and tropical climate. Most domestic activities happen in a central patio that connects 3 volumes, each with a different program: living, sleeping and outdoor cooking. Based on principles of sustainable construction, almost 80% of materials used in House Louisana were local and natural. The main structure was made of Guadua Bamboo and the walls were made of earth. These low-tech, low-maintenance and low-cost solutions can easily be replicated by the locals and are appropriate for Cormiers, a village with no running water or electricity. This project is a great example of not only involving the community but also preparing them in the event of natural calamities. The workshop on construction techniques to educate the community is phenomenal. This project involves the community in making the decision of making a house for one person and from there start a process of design which includes the community, several instructions, and cooperative building this process is very interesting. This approach to how to provide a single house to a place that needs thousands is a good strategy, since it is the community that makes the choices. The building design incorporate local language with appropriate structural techniques. The images of the community working on this house shows the commitment of community members to help others. Oficina Design: Joana Torres, Architect and Founder of Oficina Design. Artists and Artisans: Bonsy, Guetshnida, Jonhy, Vixon Lapoint, Louisana, Atis. Swoon, Corinne Loperfido, Zaria Forman and Tatyana Fazlalizadeh. The Rajapur Women’s Literacy and Healthcare Centre has transformed the lives of rural communities (in particularly women) in a remote village called Rajapur in Bangladesh. The Rajapur Centre is a permanent home to the charity Mannan Foundation Trust’s (already established) teaching and healthcare work. The aim of the Centre is to empower local women by providing income generating and literacy skills, and free healthcare for the community. This project tackles social issues those communities, living in Rajapur and the surrounding villages face; lack of access to education and healthcare and where basic essentials for living a healthy life and the opportunity to be self-sufficient are not readily available. It also tackles the fact that the majority of girls in rural Bangladesh do not continue their education beyond the age of 11. Limited healthcare is exacerbated for women which contributes to a high rate of maternal and infant mortality. 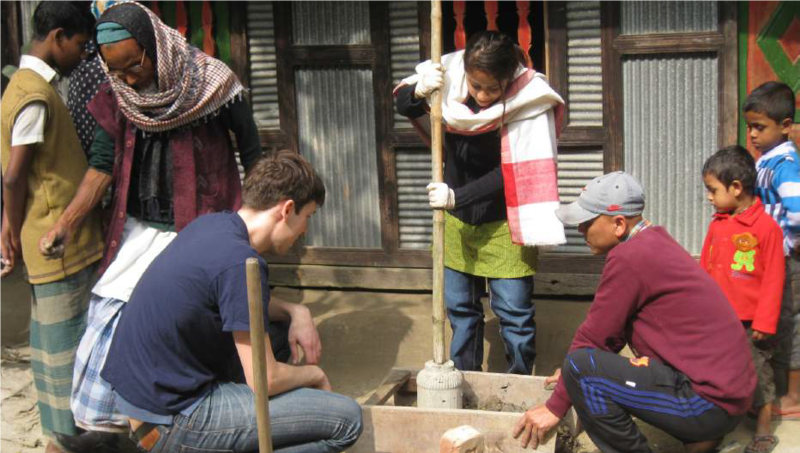 The process of the design of the Rajapur Centre, was an inter-cultural one; a team of London-based professional volunteers worked with the local community. To ensure the transfer of distribution of power and to achieve community-ownership, local community was involved from the outset, in design and in the final build. The construction of the Rajapur Centre, allowed the discovery of rich construction skills and materials that are present and available within the community and in the village. 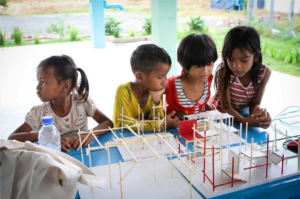 The community participation enabled the utilization of local crafts, skills and materials such as building with home-grown bamboo and rammed earth. Women in the village had the expertise to build with mud, therefore they were employed to produce the rammed earth bricks (at home), whilst local labor installed them on site in order to overcome cultural barriers to women working with men in public, on site. Community participation in the design and the construction of the Rajapur Centre, empowered the women and the community as a whole. The project is an impressive example of techno-socio-economic-cultural-gender-ecologically appropriate design at a site and building scale. The project as a whole addresses an important aspect of social transformation—women’s health and empowerment through literacy and income generation in a remote rural village in Bangladesh with cultural restrictions and lacking access to education and healthcare. The construction process also engages a rediscovery of rich local expertise and materials. Gonjiro is a thatched farmhouse which had been abandoned for more than ten years and it was in a state of near collapse. It is located in one of the numerous small coastal settlements in Japan. The community is suffering from an aging population with the aging rate of 51.5% (above 65 years old). This project addresses issues such as undermining community, abandoned farmlands, houses and degraded biodiversity in a socio-environmental integrated way through strategic re-thatching of Gonjiro. Gonjiro stands in a typical landscape called satoyama. In traditional satoyama, people have had self-sufficient lifestyles engaged in agriculture and fishery. Wood for fuel, as well as building materials, timber, bamboo and straw, were obtainable from the mountains behind. These human interventions have contributed to enrich biodiversity. Therefore, the Japanese satoyama is a human-nature, or socio-environmental integrated ecosystem. However, modernization has drastically transformed local people lifestyle. Moreover, poor manpower caused by aging accelerated its degradation. Now, the preservation of satoyama ecosystem as cultural heritage is highly demanded. Through the initiative of [R]UD (university team of architectural community design) jointly with the local community, re-thatching Gonjiro has ultimately generated a new satoyama annual cycle: harvesting the straw, thatching the roof partially and cultivating the farmland using decomposed straw from the roof as fertilizer. These chain of collective works always ends in celebrating parties all together with the emerging community of local people and students. Responding the increasing needs for gathering space, we reclaimed the ruined kitchen-house of Gonjiro and recovered the doma (inner working space with paved soil). Regarding Gonjiro house as a part of renovated satoyama ecosystem, we established a design criteria of “creative preservation” in harmony with biodegradation. The project is an excellent example of architectural preservation that is integrated with the ecological value of vernacular landscapes and rural food systems, the social value of reversing urban-rural disparities, community dislocation and fragmentation, population aging, etc. The organizing of university teams to work with village elders is potentially socially transformative, and the results of the design could have great impact on social relations and ecological processes. The revival of thatching has social-ecological importance well beyond the Satoyama landscape revival movement. Others: Arai Tsuyoshi : City Officer of Tateyama municipality; Kayazo/ Nomura Taizo: Thatcher, Kanazawa; Tanaka Koichi: Doctor, Elderly care house. This goal of the Smile Village Preschool Playground is to improve and bring joy to the lives of the villagers who are relocated from slums. It began as a design studio project in 2012 in collaboration with NGOs PSE & STEP to provide ideas for a Smile Village masterplan and continued yearly as a community service design and build project. Yearly projects are identified together with the stakeholders & residents based on their evolving needs. The continued engagement allows a feedback loop to improve the yearly projects. Students fundraise, design (with participatory process) and construct the projects with the help of the residents. Projects built from 2014 to 2017 are: Childcare furniture & Playground prototypes; Childcare Centre (Design. Build by contractor. Interior furnished by students), Playground, Youth Team Building Structure; Playground Shade & Design Workshop for public space improvement. The projects build capacity and empower the residents e.g. we only build sample pieces of the furniture and they built all the rest using our step-by-step construction manual. The childcare frees up parents to work for livelihood with peace of mind. The playground develops the children’s gross motor skills. Because the families are relocated from 3 different slum locations and do not know each other, the playground doubles up as a gathering space to facilitate social bonding. Community building is a priority and we were requested to design a structure for team building activities. The engagement with SV builds empathy and capacity in students to do social good and grooms leadership. Junior from one trip becomes the leader of the next project. The core team recruits members, plan and implement the entire project under my guidance. Since 2012, there have been 80 students who participated in the projects. A few have also volunteered as interns with the NGOs. This is a remarkable project that demonstrates a long-term, sustained engagement with community partners. 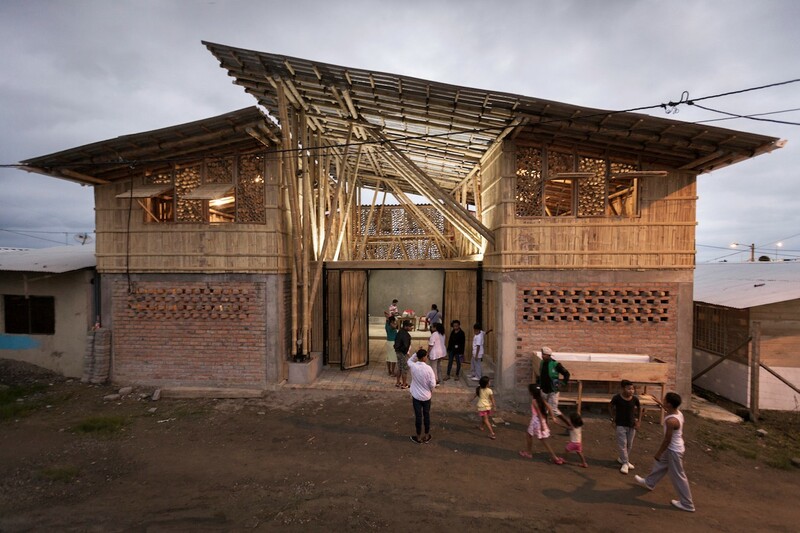 Designed and constructed with the participation of children and adults, a series of projects including playground and childcare center provided not only a refuge for children but also social space for village residents who have been relocated from an informal settlement. As a long-term effort with on-ongoing participatory and community building elements, the project holds great socially transformative potential for both local residents and participating university students.